Health and Fitness Den: Comparing Nautilus T618 versus Nautilus T616 Treadmill, What's the Difference? The Nautilus T618 and Nautilus T616 are both high-quality treadmills, with the T618 belonging to the new Performance Series range suitable for higher intensity workouts for more serious athletes. Both the Nautilus T618 and T616 Treadmills offer plenty of options to keep your workouts varied and challenging with 26 programs, speeds from 0-12 mph and motorized incline from 0-15%. Being the more heavy-duty treadmill, the Nautilus T618 has a more powerful motor at 3.5 chp (continuous horse power) compared to the T616’s 3.0 chp motor. 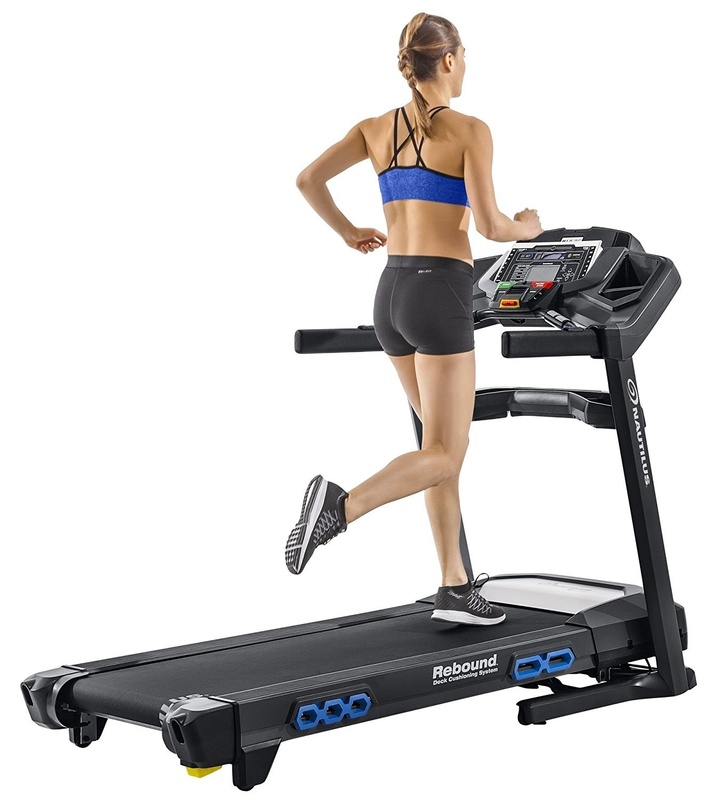 Both the Nautilus T618 and T616 Treadmills offer a generous running belt size of 20” wide by 60” long. However, the thickness of the belt differs with the T618 having a 3-ply 2.5mm Tyre belt (light commercial) while the T616 has a 2-ply 2.0mm thick belt. The Nautilus T618 also has larger crowned rollers at 2.75” compared to the T616’s 2.5” crowned rollers. The Nautilus treadmills have different cushioned decks with the T618 having a Rebound Cushioning System while the T616 has a 6 Hex Cell StrikeZone Cushioning System. 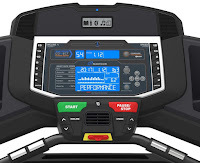 The console display on the Nautilus treadmills also differs – both feature DualTrack blue backlit 2 LCD screens but the T618’s screens are STN which is considered to be the best in the fitness machine industry and offers a wider viewing angle and better visual color combination that’s easier on the eyes. 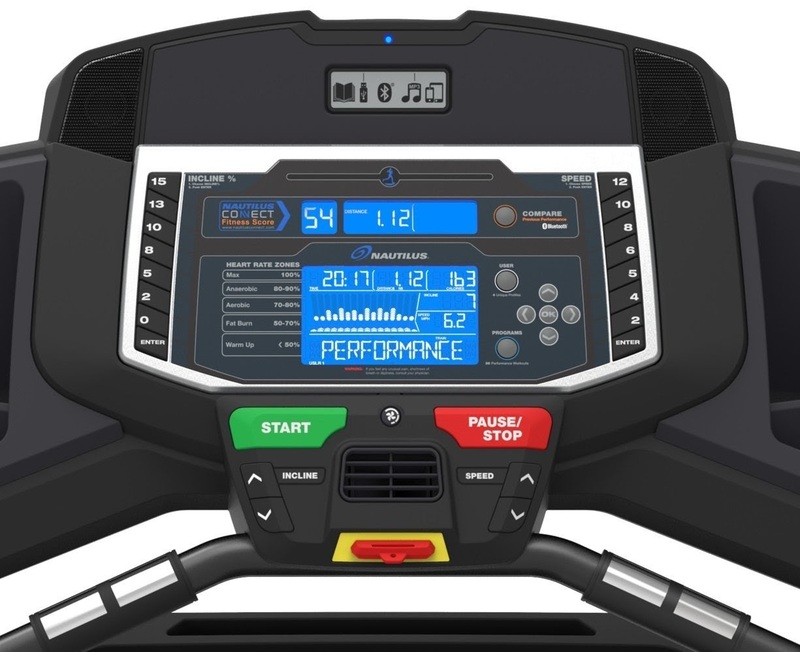 Both consoles allow for 4 user profiles and display motivating workout stats including time, speed, distance, calories and heart rate (pulse contact grip sensors and telemetry enabled). Both treadmills also feature Bluetooth connectivity so you can track your performance online with the Nautilus Trainer/Connect app or other partnered fitness apps like My Fitness Pal. 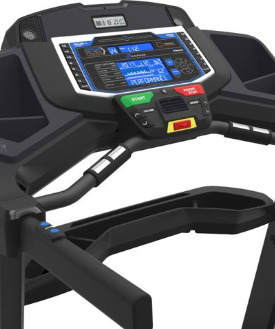 Additional high-end features on both the Nautilus T618 and T616 treadmills include a USB charging port, sound speakers with MP3 input, media shelf, 3-speed cooling fan and dual water bottle holders. The Nautilus T618 has the addition of an integrated towel rail and accessory bar which the T616 does not have. 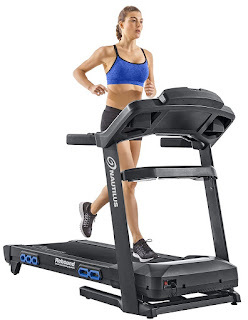 The Nautilus T618 Treadmill also features In-Reach-Controls in the handlerails for quick adjustments to the speed and incline levels, while the T616 has Quick-Access buttons on the console for adjusting the speed and incline. Both treadmills are sturdily built and feature a SoftDrop folding deck to help save space when not in use and transport wheels for easy relocation. The Nautilus T618 is heavier than the T616 and allows for a higher user weight capacity of up to 350 lbs compared to the T616’s maximum user weight of 300 lbs. Both Nautilus treadmills come with an impressive manufacturer’s warranty, with the T618 having a longer warranty to reflect the confidence in its heavy-duty durability (see table below). I don’t think you’ll be disappointed with either of these Nautilus treadmills. For many people looking for a moderate workout at home, the Nautilus T616 Treadmill would be more than adequate for their needs with plenty of options to keep your workouts varied and interesting. If this suits your needs, then opting for the T616 will save you some hard-earned $$s! If on the other hand, you’re looking for a more serious workout, then opt for the Nautilus T618 Treadmill from the Performance Series as it’s designed to hold up to taking more of a pounding and is ideal for more intensive training. The durable heavy-duty design is worth the extra $$s over the long-term.